The farmers of Muttur and Eachilampathu divisions have named the company with the ancient name of Muttur area, Kottiayarapattu. The main objective of the company is to address the needs of the farming community of Muttur and Eachchilampathu divisions, south of the Trincomalee district. The services of the compnay would include providing good quality seed paddy, increasing the availability of suitable varieties, making available enough seed paddy on time and promoting self-seed paddy production for increased yield and production. Another aim of the company is to lead the farmers from survival agriculture to commercialized paddy production and also to promote localized market economy, department of Agriculture sources said. The Project Director of the IFSP, Ms. Rohini Singarayer, handed over the registration book of the company to the Chairman of the Board of Directors, Mr. A.Uthayakumar. GTZ-IFSP Trincomalee team leader, Dr. Geinitz Dedo, officially handed over the seed cleaning machinery, which has been installed in Muttur at a cost of 1.5 million rupees, to the company funded by the IFSP. IFSP Project Director, Ms. Rohini Singarayar, handing over the company registration to the company chairman, Mr.Uthayakuamar( L). 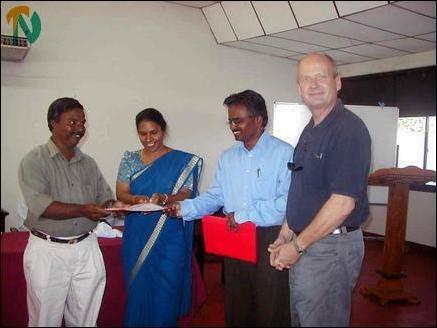 The Assistant Director of Agriculture, Mr.Sivakumar, and GTZ-IFSP team leader, Dr Geinitz Dedo, are also seen( extreme right). The Trincomalee district is located in the dry zone of Sri Lanka and the mean annual rainfall is in the range of 756 mm to 2086 mm. The potential area for paddy cultivation in the Trincomalee district is about 41,200 hectares (101,000 acres), which includes the Yala and Maha seasons. Three Agricultural Officer (AO) segments and eleven agricultural instructor ranges (AI) provide extension and other services to the farming community in the district. The Muttur AO segment comprises the six AI ranges of Muttur, Sampoor, Thoppur, Munnampodiveddai, Killiveddy and Eachilampathu. The Muttur AO segment addresses the DS divisions of Muttur and Eachilampathu with approximately 16 thousand farm families. The total potential paddy area is 8,497 hectares, of which 4,706 ha come under major irrigation schemes, 1,071 ha come under minor irrigation schemes and 3,350 ha are rain fed. "The conflict had an extremely negative effect on the paddy economy. Most of the infrastructure such as road networks, irrigation facilities, marketing, extension service and the availability of agri-chemicals were constrained. After the communal violence of April and May this year in Muttur the paddy economy almost collapsed. The yield from Maha 2002-2003 was to a large extent not sold prior to Yala 2003. The Yala season 2003 was lost for many families who were prevented from preparing their fields for cultivation due to the violent communal clashes in April 2003," the IFSP said in a study. At the inaugural event of the farmers company, Mr. Uthayakumar, the chairman, said that farmers of Muttur area have been undergoing untold difficulties in marketing their agricultural produce. The cost of production of paddy has increased thrice due to shortage of labour and other reasons. The company is to undertake seed paddy production immediately to fulfill the needs of the farmers. The newly formed company would take appropriate steps to fulfill the urgent requirements of the farmers, he said. Provincial Deputy Chief Secretary (Planning), Mr.V.S.Swaminthan, in his keynote address said the naming of the farmer's company with the ancient name of Muttur, Kottiayarapattu, has rekindled the pristine glory of the Muttur. 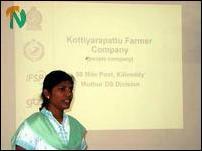 The Kottiayarapattu farmers' company should work for the economic development of the farmers in the area. GTZ-IFSP team leader Dr Dedo said Tamils and Muslims have been living in Muttur for a long time and communal harmony was essential for the success of the company. Ms. Singarayer, Assistant Director of Agriculture, Mr. S.Sivakumar, and several others also spoke. 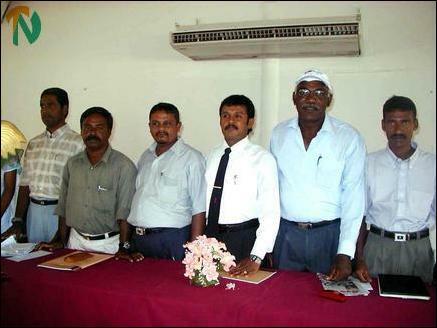 Members of the Board of Directors of the Peoples' Company formed by Kottiyarpattu Farmers.